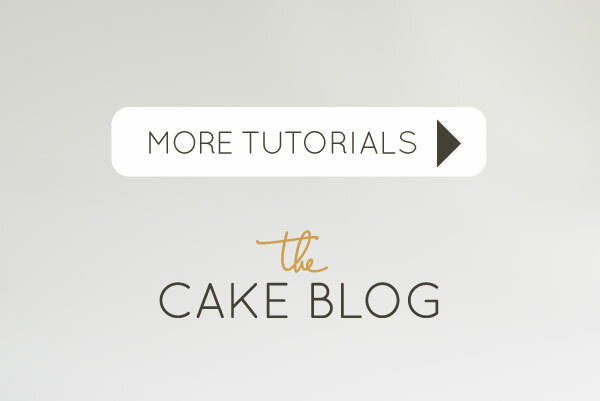 Our contributor, Erin Gardner of Erin Bakes, is back with a new tutorial today! Every year I see brightly colored chocolate sunflower seeds in the store and every year I think to myself that I must do something fun with these! They typically end up on my counter top being munched on as I get my holiday cooking and baking done. Don’t get me wrong, that’s a perfectly good use for them! 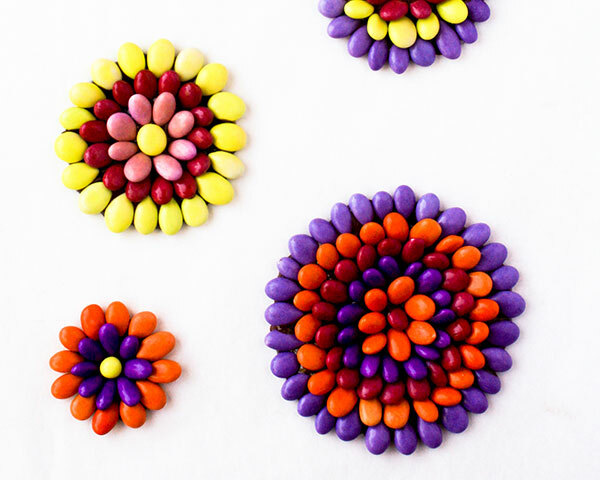 But this year I finally decided to do something fun, creating these easy and tasty chocolate sunflower seed medallions. 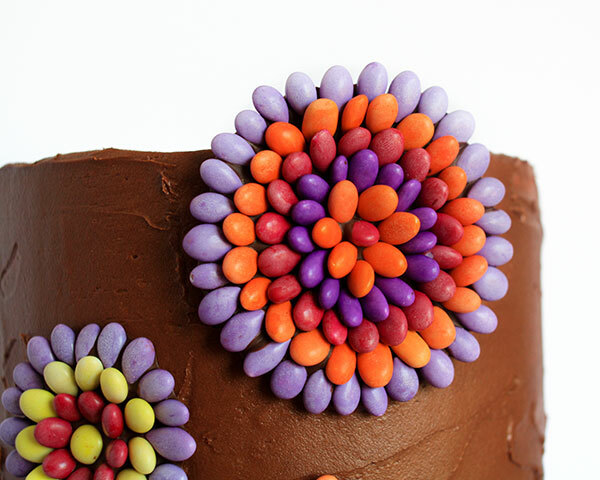 Since confetti is still hot-as-ever in the world of cake design, I figured why not add these little gems to the list of edible confetti options for the sides of cake. What I love most about using chocolate sunflower seeds in this way is that they’re actually delicious, too! 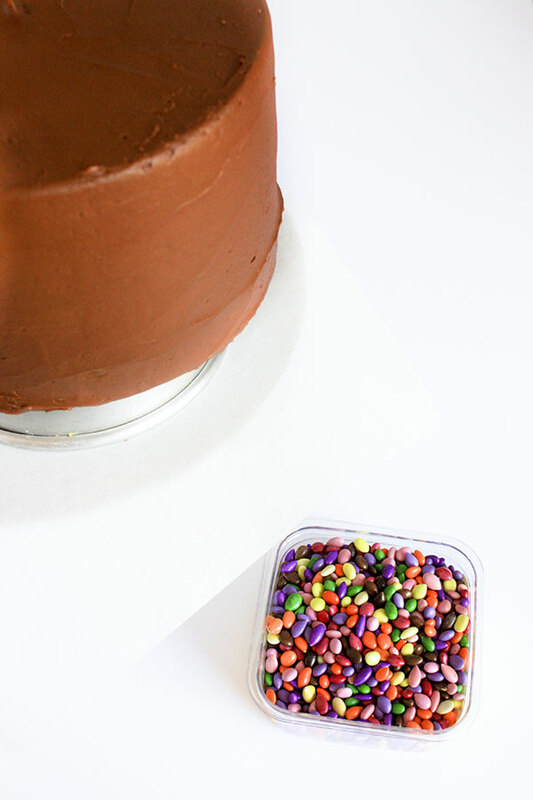 Place the cake that you want to coat with confetti onto a cake pan that’s smaller in diameter and has been flipped upside down. I placed my 8-inch round onto an upside down 6-inch pan. This gives your hand room to add sunflower seeds around the bottom edge of the cake. Place the cake and pan onto a sheet pan lined with parchment paper to catch any seeds that bounce away. Scoop up sunflower seeds into the palm of your hand. 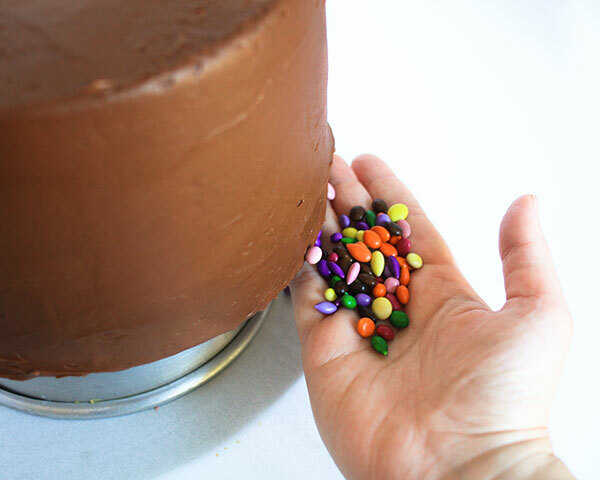 Use your other hand to steady the cake while you press the sunflower seeds into the buttercream. 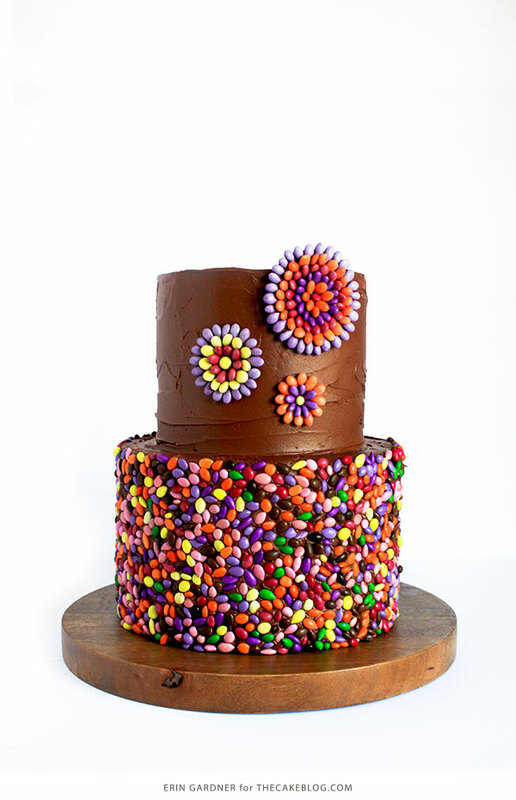 Work your way around the entire cake, filling in any gaps as needed. 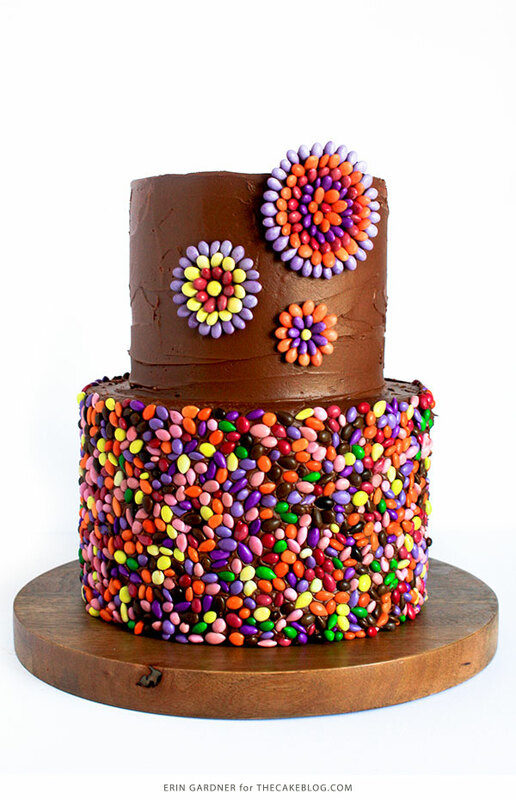 I used the better part of a 7.5oz container of sunflower seeds to cover the sides of an 8-inch round cake. Draw circles of varying sizes onto a piece of parchment paper. Free-hand them, or use circle cutters or drinking glasses as your guide (really anything round). Melt chocolate in a small heatproof bowl. I prefer the good stuff for this project, although candy melts will work too. 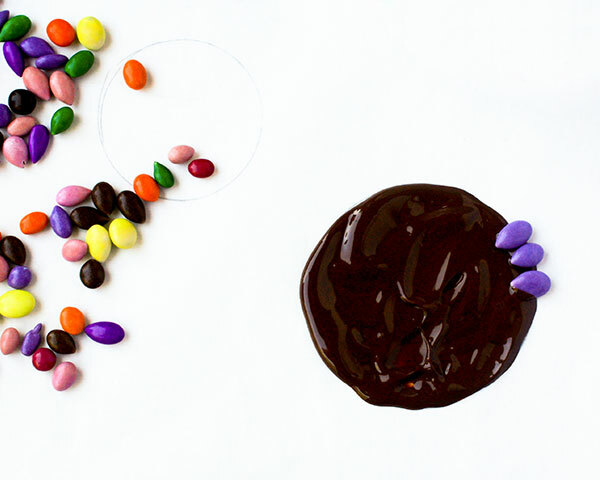 Real chocolate will stay soft longer than candy melts, giving you more time to add your sunflower seeds. 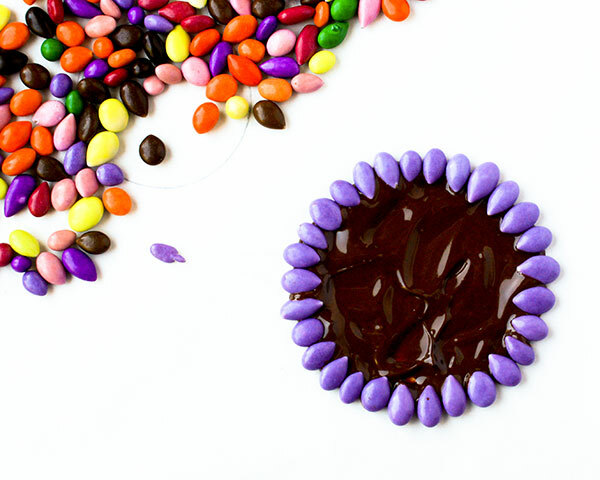 Use a spoon or piping bag to fill in a circle with chocolate. 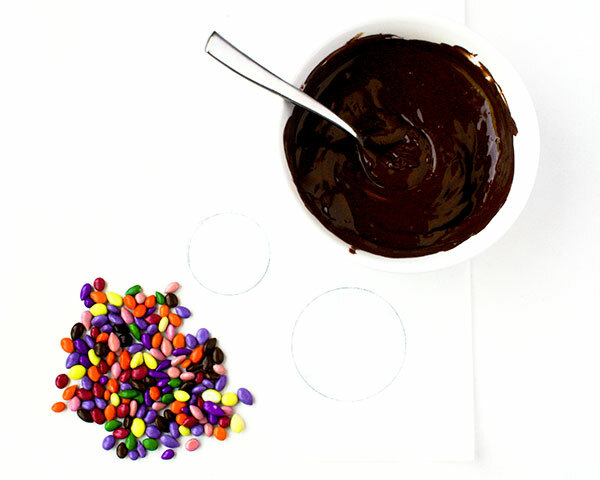 Add rows of sunflower seeds to your melted chocolate, working from the outside in. Add more chocolate if your first layer sets up too quickly or if you have trouble getting the seeds to stay in place. Allow the sunflower seed medallions to firm up at room temperature. You could pop them in the fridge to help quicken the process, but definitely don’t store them in there. The fridge’s humidity will cause the color on the sunflower seeds to run. Press your finished medallions directly onto the sides of your buttercream iced cake, or store medallions in an airtight container at room temp for up to a month. These stunning but simple chocolate sunflower seed medallions would also work beautifully as cupcake toppers or arranged on a plate with other holiday treats. 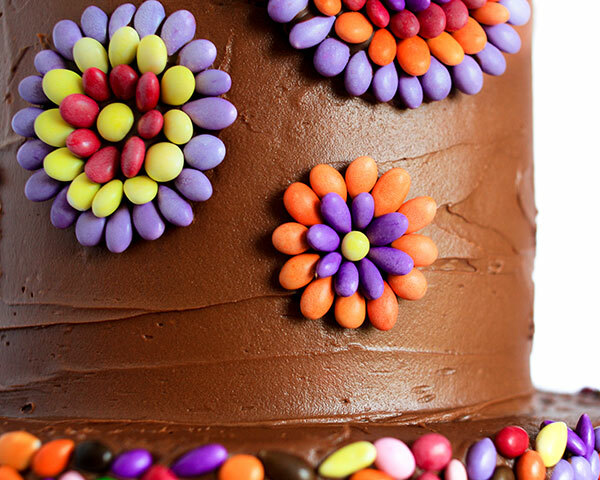 Find more fall DIY projects and recipes in our our Halloween Cake Gallery! « Can You Overmix A Cake?